May I begin by thanking His Excellency the President of The Republic of Kenya, Honourable Uhuru Muigai Kenyatta, for appointing me Kenya’s Ambassador to Ireland. During my tour of duty, I shall endeavour to serve the interests of the Republic of Kenya, the people and Government in fostering closer bilateral ties with Ireland and her people. I wish to also thank the Ministry of Foreign Affairs and International Trade, the Mission staff in Ireland and the Department of Foreign Affairs-Ireland, for the exemplary guidance and assistance, that made mine and that of my family’s welcome to Ireland most memorable. The presentation of credentials to His Excellency the President Michael D. Higgins on the 20th January 2015 at Áras an Uachtárain was well received, due in large part to you all. The reception from the many Kenyans, living in Ireland thereafter, was a wonderful gathering that will evolve to gainful engagement as we all join hands to better our nation of Kenya. Kenya has had a long association with Ireland dating back some ninety years with the Kenya Irish Society’s formation and the Government of Ireland’s participation in the development of various sectors, through aid from Irish Aid and Irish NGOs working in Kenya namely Trocaire, Concern, Goal, Christian Aid, Friends of Londiani and Holy Ghost Fathers to mention but a few. The relationship with Ireland has been further strengthened by the opening of an Embassy in Nairobi recently and the appointment of an Ambassador. The two countries are now well placed to further their interests in areas of development, bilateral trade for the benefit of both nations’ inhabitants. The long and cordial relations that have existed between our two nations has been focused on the wellbeing of our people and those worldwide and has culminated in our recognition, by the United Nations(U.N.) nominating Kenya and Ireland to co-chair the post Millennium Development Goals strategy, evolving into the Sustainable Development Goals 2015-2030 targets. Kenya is already pursuing the Vision 2030 objectives and has developed into a Middle Income Nation having set forth an aggressive, objective programme to meet the set targets. mineral extraction potential of coal, crude oil, titanium, niobium, cement, precious minerals and other raw materials with the view of setting up plants and factories to utilize to the maximum their usage. I.C.T Hub for regional network provision and involvement of multi-national concerns in this field situated in Ireland. a well-educated labour force, in the region that can participate in ensuring successful implementation of set objectives. As the leading economy within the East and Central Africa region, Kenya boasts of a stable and improving business climate, exceptional touristic facilities, access to a functional devolved system of governance, guaranteeing investment from the grassroots for the direct benefit of the people in the both rural and urban areas. These are just some of the areas in which Ireland and Kenya can participate in development. Of particular importance, is the Kenyan Diaspora, recognized as one of the most important development and investment engines for our country, with remittances reaching KES.113 billion in 2014 and growing, who have the potential to become investors in the infrastructural and economic sectors of their beloved nation. Collaborating with the Kenyan Diaspora Associations worldwide, we will seek ways of incorporating the Kenyan diaspora in Ireland, their associates and friends to open up space for sustained participation in development, geared towards growth and partnership in all spheres of both our nations’ objectives. Every effort shall be made to ensure the Diaspora are participants in national development, with provisions being made for investment, partaking in every constitutional activity for national progress, as you are part of Kenya, irrespective of where you are. The government will continue to make, in consultation with you, improved access to services and opportunities for your inclusivity and wellbeing. 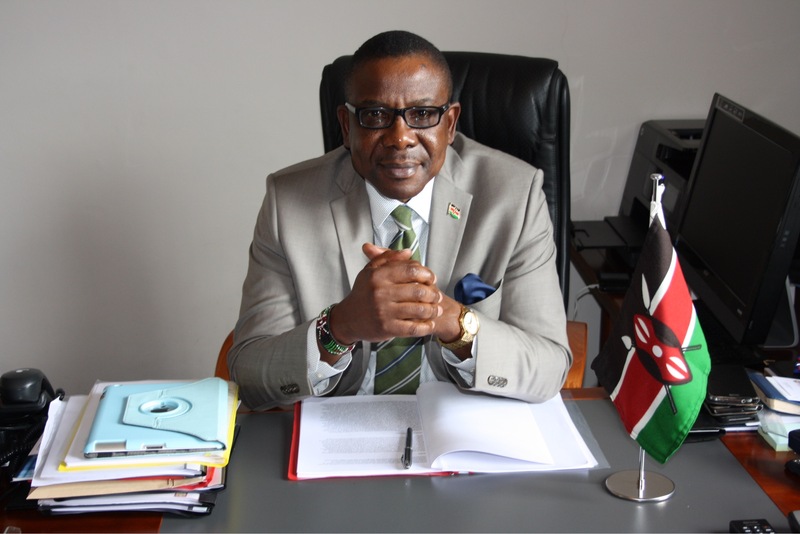 As such you are encouraged to periodically update yourselves on the activities in Kenya by visiting the newly launched Diaspora website on www.diasporaportal.eurocom.co.ke and register. The plethora of information that can be extracted from this site, will keep many of you abreast of our nation’s development agenda and progress. Kenya remains a sincere and valuable friend of Ireland and our history of association shall grow in strength as we seek and continue to partner in matters social, economic, environmental, trade, and all development issues, which will lead to increased trade and improved bi-lateral and multi-lateral diplomatic relations for generations to come. I look forward to working with all parties to grow the interests of our two nations of Ireland and Kenya, during my tour of duty.